1. ] Whatever his revolutionary pretensions were in the past, in the last eight years Mummar Qaddafi has become a compliant, if somewhat unorthodox, third world ruler in the world imperialist system. The changes in the stance of his regime since 2004 are unmistakable. His rapprochement with the EU and even the US after Bush sent Biden to Tripoli on Air Force Two has been well documented elsewhere, as has been his association with Richard Perle and Goldman Sachs. He has joined the IMF, allowed western oil companies to directly exploit Libyan fields and privatized hundreds of key public enterprises. In spite of all the drama of the past, it should be clear to all that the Mummar Qaddafi of 2011 is one that has made his peace with the imperialists and they with him. Contrary to what the Qaddafi supporters would have you believe, there has not been a continuous momentum for imperialist regime change in Libya for the past 40 years. 2. ] The Arab uprisings of 2011 have been doing away with such rulers. Most close observers to the uprisings in Tunisia and Egypt knew than Ben Ali and Mubarak were all washed up before the dictators did. The people had simply lost their fear and they weren't going to get it back. But the imperialist still backed their tamed dictators until the last. Only four days before he departed, US Secretary of State Hillary Clinton was saying Mubarak may not be able to step down soon and France stopped another shipment of supplies to Tunisian state security only two hours before Ben Ali fled. Still, no number of arrests and amount of mass murder, and mass murder was committed by organs of state security in both Tunisia and Egypt, was going to salvage the old dictator. In the end, the imperialists were willing to throw them under the bus in the last days because they hoped, with the help of some sleight of hand, to salvage the old regime or something close to it. The struggle to overthrow Qaddafi poses a certain threat that the overthrow of Ben Ali and Mubarak didn't. In the case of Tunisia and Egypt, the imperialists had other important connections and levers to maintain colonial power, most notably through the army. These entrenched positions represented pre-established fall-back lines, as it were. They could afford to see the dictator toppled so long as the army didn't go with him because they could still maintain their influence through the army. That is why in both cases, the army didn't open fire on the rebellion. They didn't want to risk it going down with an unpopular dictator. They thought it better to keep the army in place and yield on the people's key demand that the dictator go. 3. ] But the case of Libya in different. Because of the peculiar nature of Qaddafi's "green revolution", because military-to-military relations between Libya and the US are only a few years old, and for a host of other reasons, the imperialists have no ready-made fall-back position in Libya should Qaddafi go. That is why the contradiction has become so sharp in Libya. That is why Libya became the first country in the string of revolts in which military power was used to put down the rebellion. In the beginning there were no strong sanctions against Qaddafi for using what was an unprecedented level of violence, such as war planes, against mass protests. The imperialist were secretly happy that someone was trying to staunch the fall of dictators with massive violence. Although they had made millions selling Qaddafi precisely the weapons he was using, like the cluster munitions from Spain, they were glad that the massive violence was being tried by someone they were not generally publicly associated with. NATO countries had little more than words to show for their 'humanitarian concerns" after Qaddafi killed 700 protesters in Tripoli on February 21, some of them bombed with jet aircraft, and maybe 2000 in Benghazi days before. When President Obama spoke of this on February 23, he condemned the Libyan government, saying "suffering and bloodshed is outrageous, and it is unacceptable", but he did not call for Qaddafi to step down nor did he announce any new sanctions the US would support to punish the leader that he said "violate international norms and every standard of common decency." By the last week of February it was beginning to look like the Qaddafi regime would fall in days, not weeks. Once he showed that he could hang on to power by meeting the rebellion with a war, the level of violence that was applied to the uprising in Yemen, Bahrain and Syria was dramatically increased. Bahrain declared martial law and cleared out the Pearl Roudabout around about March 15. That was the same week they started shooting protesters in Yemen. On March 18, 52 protesters were shot dead in Yemen. Assad was also stepping up the level of violence used against the Arab uprising in Syria. On March 15, there were 3000 arrests and a few martyrs. On March 24, more than a hundred were killed for being in a protest march in Daraa. 4. ] Qaddafi used his army to stay in power because he could. In both Tunisia and Egypt, the dictator demanded that the army open fire on protesters as a last resort. In both cases they refused. No doubt, this was what the Pentagon advised. It's better to lose a loyal servant and still stay in the game than to risk all for a washed up has been. The generals on both sides of the military-to-military accord could agree on that. In Libya this was not an option. Qaddafi made sure the national army was a poor stepchild. The real power and the most sophisticated weapons belonged to his personal security force. Here he had a force impervious to foreign influence and one that proved that it would open fire on the people when ordered to, even with air strikes and artillery. 5. ] Libya is different because it has great oil wealth. For 41 years that wealth has been under the control of one man. Libya also has a very small population. Because of these very unique circumstances, Qaddafi has been able to head a state and state security apparatus that is relatively independent from revenues drawn from the country by ordinary means like taxation. With this oil money he has a great ability to "win friends and influence people" not only within Libya but among many international forces as well. There are many AU heads of state, and other anti-imperialist leaders and organizations that owe Qaddafi, for example he gave $3 million to the Nation of Islam to build their headquarters in Chicago. 6. ] Qaddafi's use of military power to stay in power was acceptable to the NATO countries. Qaddafi started using military violence against protest rallies as early as Feb. 20, yet UN/NATO did not act militarily until March 19. They were willing to give Qaddafi almost a month to put down the rebellion with tanks, artillery and aircraft. NATO is now completing its planning in order to be ready to take appropriate action in support of the United Nations Security Council Resolution 1973, as part of the broad international effort. and while the NATO Secretary General calls upon Qaddafi to "stop your brutal and systematic violence against the people of Libya immediately," He does not call for his removal or even ask that he step down. On March 22, more than a month after Qaddafi has started using aircraft and artillery against protesters, NATO decides "to launch an operation to enforce the arms embargo against Libya." For more than a month he has been allowed a free hand in the application of massive violence to put down the rebellion. Two days later, and a week after the UN legalized the no-fly zone with 1973, NATO announces that they have decided to enforce it. Finally on March 27 they announce that "NATO Allies have decided to take on the whole military operation in Libya under the United Nations Security Council Resolution." This was no rush to provide military assistance to the rebellion as soon as it was needed, or even as soon as it had been made legal by the UN resolution. This was a "wait and see" policy. A "wait and see" if Qaddafi's massive violence would work. If it did work, they would have gone on paying him for Libyan oil just like before. 7. ] They acted only after it was clear that Qaddafi could not prevail. Qaddafi's military might was the greatest at the beginning and so were his chances of crushing the rebellion by military means. In the beginning the rebels were using meat cleavers as weapons. As time went on, they got better and better weapons and they learned how to use them. Even before NATO entered the game, they managed to get some old Qaddafi MIGs back up in the air that hadn't been off the tarmac in 15 years. The rebellion always had the vast majority of the Libyan people on it's side, that's how it survived, and even without NATO's intervention, slowly but surely, the balance was shifting in it's favor. NATO came in on the side of the rebellion in order to establish a connection and influence the people and institutions likely to control the oil after Qaddafi is gone. 8. ] NATO has modulated it's support to extend the conflict and force concessions from the rebellion. Enforcement of the no-fly zone probably got delayed a week because the freedom fighters arrested rather than welcomed a British SAS team that dropped into Benghazi unannounced on March 4. Since then the anti-Qaddafi forces have often found NATO support not everything it's cracked up to be. On Tuesday, Abdel-Fattah Younis, chief of staff for the Libyan rebels' military and Qaddafi's former interior minister, said NATO didn't "do anything," even though the U.N. Security Council had given the alliance the right to act. He blamed NATO's bureaucratic procedures for eight-hour delays between the time the rebels told NATO of enemy targets and when its attack planes arrived. "The people will die and this crime will be on the face of the international community forever. What is NATO doing?" Younis said. "NATO is not doing their job, the aistrikes are late and never on time. NATO is not helping us. Qaddafi still gets ammunition and supplies to his forces, that's why he is pushing us back," said Pvt. Mohammed Abdullah, a 30-year-old former member of Qaddafi's army who has joined the rebel side. There have been a number of suspicious "friendly fire" incidents where NATO has carried out air strikes on rebel forces. On April 2, 13 freedom fighters were killed by a NATO strike, and less than a week later the rebels say that they were forced to retreat in a struggle to break through government lines outside the crucial oil town of Brega by more NATO "friendly fire." This left some resistance fighters shouting "Down, down with NATO." Whatever the cause of these incidents, they have been used by NATO to argue the need for NATO personnel on the ground and for bringing the rebel army more under NATO command and control. If Colonel Qaddafi were to lose Zawiya and its refinery, the game would probably be up. The pipeline to Zawiya passes through rebel-held land near the Nafusa Mountains: pouring cement into a valve would shut it down. But Western governments have persuaded the rebels not to touch either that pipe or a nearby natural-gas one that helps keep Tripoli’s lights on. They have already determined that Qaddafi is no longer viable. They are now modulating their support for the uprising to assure that the uprising is not defeated but neither is Qaddafi. They are manipulating aid to the rebellions to win concessions in an attempt to bring the rebellion under their control and reshape any future government of Libya to be one that is more to their liking. That is their game plan. So it is not surprising that they have come to the aid of the rebels or that that the rebels have accepted that aid. Revolutions are never simple two-sided affairs. There are always many players. Agents of the oppressor will always try to infiltrate or influence the revolution with the ultimate goal of overthrowing it. At the same time, there has probably never been a successful revolution that did not exploit contradictions among the oppressors. Today is Independence Day in the United States and we again celebrate our successful struggle for independence from England and the French support that helped us achieve it. The Bolsheviks received some assistance from the kaiser's Germany that was crucial to the success of the Russian Revolution. 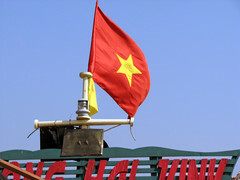 Ho Chi Minh allowed himself to be treated by US OSS officers, General Giap accepted weapons from the US, fought along side OSS officers and was happy to have them training the Viet Minh in their fight against Japanese imperialism. In each case the colonialists or imperialists that "supported" the revolution did so with their own agenda and with an eye towards promoting it's interests in the region. There has also never been a revolution that waited until there was no longer significant popular support for the old regime. As long as Qaddafi puts bread on the table for hundreds of thousands of families in his security services, as long as his money doesn't run out and as long as he can keep Tripoli in lock-down mode, we can expect he will be able to fill Green Square with thousands of loyal supporters. Some forces in the anti-imperialist movement in the United States are like a viewer who comes into a movie in the middle. They think they know what's going on but they don't. These groups have never acknowledged the bloody nature of Qaddafi's crackdown or voiced support for the Arab uprising in Libya. They don't see the Libyan people's uprising against the Qaddafi dictatorship as being the principle driving force in this situation. They don't see that the Qaddafi regime is still the principal enemy of the Libyan people. NATO intervention doesn't change that, it just makes it more complicated. Those that have already thrown the Libyan revolution under the bus and see in the Libyan situation only or principally, imperialist aggression against another 3rd world country are actually tailing after and serving imperialism. That is why they never supported the people's revolutionary movement in Libya even from the beginning of the Arab uprising there and even now they struggle against the free Libya movement here in the US. Libyans are spilling their blood for us all! 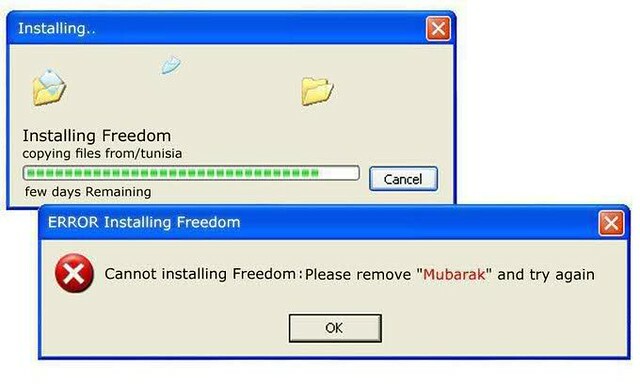 2011-02-10 Mubarak Expected to Step Down! 2011-01-28 Mubarak Refuses to Step Down! 2011-01-28 Egypt is on Fire! Google Supports Revolts | Anonymous does too! Secret U.S. Intelligence Source on Middle East Revealed ! Are "mutinous officers" are being executed in Egypt now? Senior Egyptian Army Officers Ordered Massacre! Act Now to Stop Mubarak's Thugs From Killing More! Tunisia: A Single Tweet Can Start A Prairie Fire! EMERGENCY: DKos Must Act Now to Protect Tunisian Bloggers!